Across the Donggang and following the national road further, which shapes “S” we can find a quiet village at the 700m high land above sea. It is the Jumun village at Hadong-myeon, Yeongwol-gun, Gangwon-do, Korea, which is a typical village at the remote countryside where 30 households live by the dry-field farming with nature. In this village where white buckwheat flower ripens red and beautiful scenery with the generosity of the elderly women attracts, is the story behind the scenes. The village used to be a busy mining town where about 8,000 resided with varied shops such as beauty shops and even the movies. However the town became desolate since the mining was closed in 1989. Of those elders who were left in town, those who were engaged in the mining work got sick and passed away. Now most of the remnants are the poor elderly women living alone. 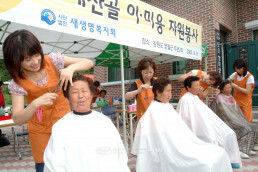 On hearing that the seniors have to spend the whole day to cut hair because they have to take the bus, which operates three or four times a day not to mention the cost, the New Life Welfare Foundation members came to visit the Jumun village before the Chuseok. On September 8, including the 10 beauty experts with 10 yea-experiences, around 20 members left for the Moun hall of the aged at Jumun-2ri with high-quality perm chemicals and various beauty care instruments early in the morning. 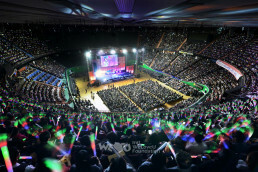 After four hours drive, the members arrived at the Moun hall for the aged, Jumun-2ri. The elderly women and the couple of the village chief who came first warmly welcomed them. After greeting the elderly women who held their hands firmly saying, “Thank you for coming this far,” the members rearranged the tables and chairs so that they could start to cut hair. “We will make you beautiful with bulky hair and perm because you are all fashionable.” As the members started to dress their hair with skillful hands and scissor, the elderly women became shy but their face bloomed with smile. The members served them with beverages, snacks and candy as well as massage throughout the service and became companions with them. The elders didn’t forget about showing off their children, while talking with the young companions. “People say that I have good and decent children. Moreover, my daughters in law are also great. My youngest son never fails but passes all the exams. I hope he can get married soon . . .” The elderly woman Kim Yeongchul(72) who has four sons and two daughters living apart from home is pleased to see them all for the holiday. 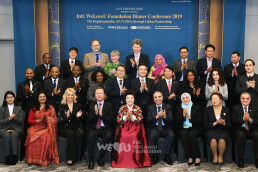 The elderly woman Park Geumyang(66) who visits her eldest son’s house at Ulsan alone on every holidays said that she was greatly moved by the devotional acts of the volunteers to the elders and that she would ask their children to live by helping others, too. They all looked excited to see their children and grand children with neat and tailored-look in a few days. When the members took out the lunch box prepared by themselves, the elderly women waved their hands and brought out delicious and hot chicken soup. As the parents want to feed their children even if they are not affluent enough, they fixed devotional and heartful meal for the members. Not rejecting their goodwill, the members enjoyed the meal with thankful mind. In response to the remarks from the village chief Kim Heung-sik(51) who is a youth(?) and takes care of the difficulties of the elders by taking all the hard works on him, the crowd loudly applauded. The elderly women all looked lively and younger because of their newly dressed hair. When the head of the myeon Ahm Gi-ok visited the spot and asked where all these newly wedded wives came from, the crowd got more pleased with his remarks. He mentioned that though the government supports the basic needs of the elders such as foods and so on, they felt inconvenience in terms of medical and beauty facility because the village is remote. After the perm, the seniors were pleased to find that their hair changed into beautiful. Then they had a great time by joyfully dancing and singing. In the afternoon, the member of county assembly of Yeongwol came to the village with special products such as grapes and beverages and encouraged the volunteers. As the service was almost completed, the residents, the member of the assembly and the village chief who came late had their hair cut and changed into neat and newly married bridegroom. In no time all the haircuts were completed and the members put everything in order. When the farewell time, the elderly women said regretfully, “It would have been better for you to play around and have fun with us rather than work only.” “Even my own daughter and daughter in law are not as devotional as you. Thank you for your service.” “Please come again next year when the corn ripens and play with us with relaxation.” Then the seniors grabbed their hands firmly. On asking the seniors to stay healthy until they come again next time, the members got on the vehicle and waved their hands with the seniors deeply missing one another. 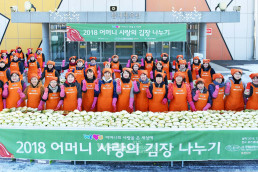 “I am deeply moved because the seniors looked so happy from their hearts even if we haven’t served them enough.” Says the members Kim Jeongsuk(40, Seongnam branch). “I realized that we have to make our world better place by ourselves as we are rejuvenated by dressing our hair beautiful. In fact, the members have personally served for haircut before, but this time they have gathered together and helped the seniors in remote mountain village. They told that it was a great experience for them and they pledged to deliver love and new life to every corner of our society through voluntary service in their power.